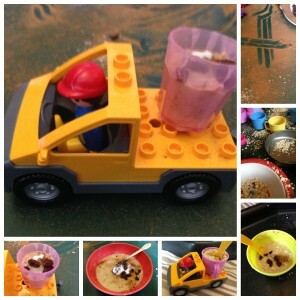 On Friday afternoon we combined two of our favourite things – stories and messy play. A few weeks ago, the children asked if they could have a book day. Since then we have revisited the idea several times, often on a Friday afternoon, including our story picnic the week before last. So we have decided to make it a regular weekly event. On previous occasions, the children have made lots of collections of books and the toys that go with them, but I was aware that they spent more time collecting than concentrating on the stories! This time I suggested reading just two stories and basing our play around them. 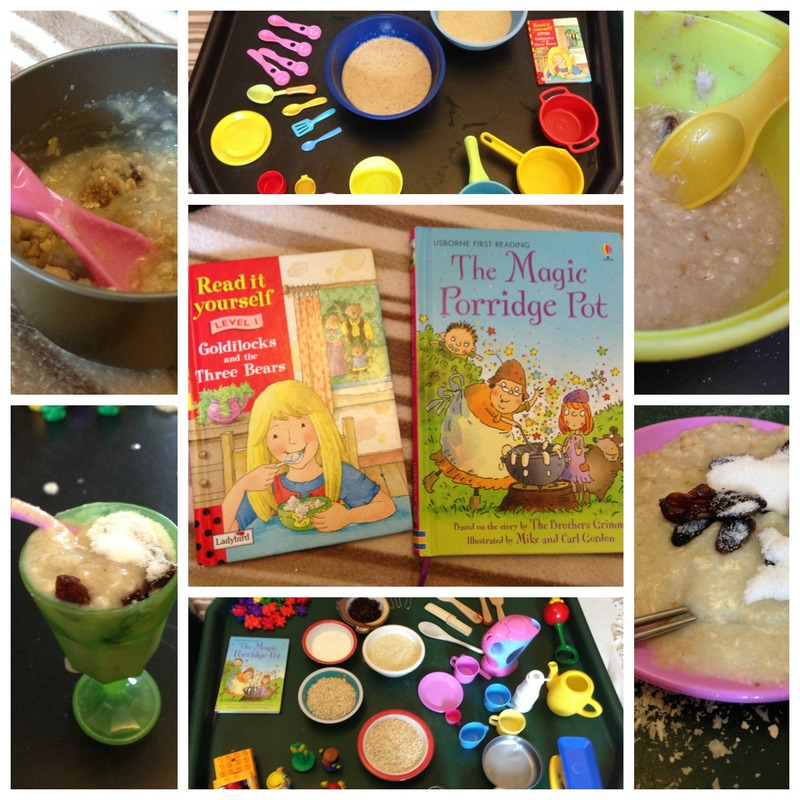 We read Goldilocks and the Three Bears and The Magic Porridge Pot and then the children gathered the toys they wanted to play with while I made some porridge. I recently wrote this post, touching on the ethics of messy play with food. It has been shared again on twitter over the weekend (thank you BritMums) and discussed in relation to the BigIF London event and the campaign to end world hunger. I think I need to write another post on the subject to respond to some of the comments on twitter properly, but I wanted to mention it here too. 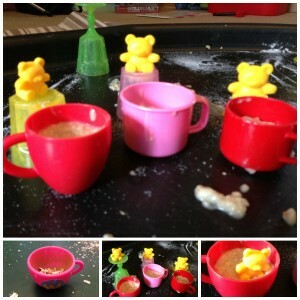 We are still playing with food, and I believe the benefits for the children are important enough to justify it. However, I have taken some steps to reduce waste. When making the porridge, I tried to cook the amount the children would actually eat, and I got it about right. We did the activity at snack time, and of course some of it got smeared around the Tuff Spot (and on their bodies!) but they did eat most of it. I am mostly trying to let the children play with food in such a way that it can be eaten as well, rather than mixing edible and inedible ingredients. However we do still play with flour and cornflour, which I do not encourage the children to eat! When we play with dry food ingredients, I try to reuse them as many times as possible. We currently have a mixture of rice and lentils which has been used a lot, and now contains a bit of flour and some sand too! 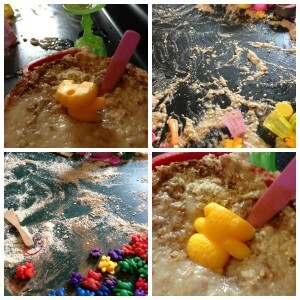 On this occasion I was not able to save the dry oats that we played with as they became mixed with the porridge. This was probably because it was raining so we had to play indoors with the Tuff Spots next to each other. If we had been in the garden, I would have put them further apart so that they were two separate activities. 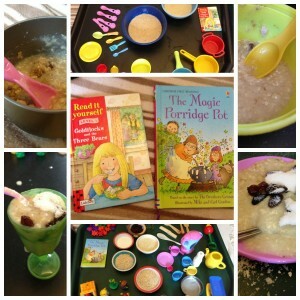 For this activity, I made some traditional porridge, and also some instant hot oats. I used water instead of milk to try to reduce food waste. Then I started to think about the amount of water we generally play with and whether we need to think about that issue too. At this point my brain started to hurt from overthinking! In addition to the two kinds of cooked porridge, I gave the children some dry oats and instant oats to play with, and some sugar, raisins and cinnamon to add to their porridge. The children had a lovely time making mixtures of the various ingredients, using a Lego Duplo truck to deliver them (with a Playmobil 123 driver!) and eating rather a lot of very sugary porridge. They also discovered that cinnamon was very good for making marks in. 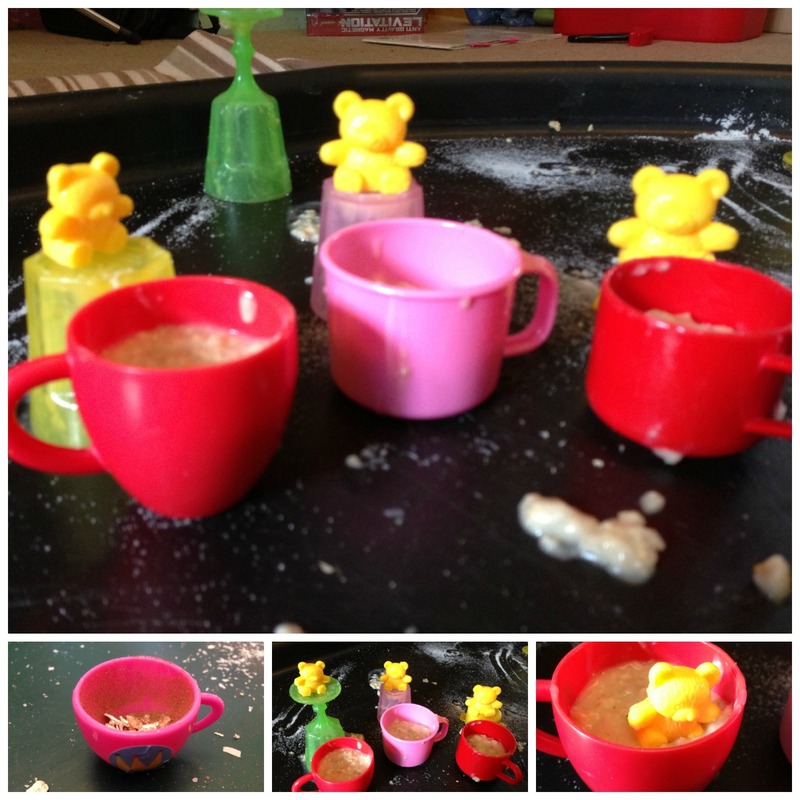 Monkey made a scene from the Three Bears story with our Maths bears (normally used for counting, colour sorting and comparing ) but it wasn’t long before the bears were swimming in the porridge. Monkey and Rabbit are both so good at reading, writing and spelling that I don’t often focus on them quite so much when we are mark-making. 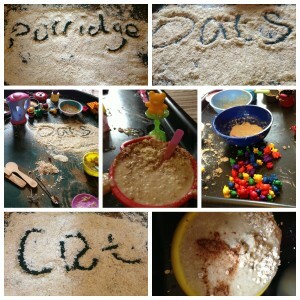 However, Monkey did learn to spell the word “porridge” during this activity! We had so much fun with our messy play this week, as always remembering Matilda Mae and her lovely mummy Jennie who has given us so much inspiration for our play and learning. 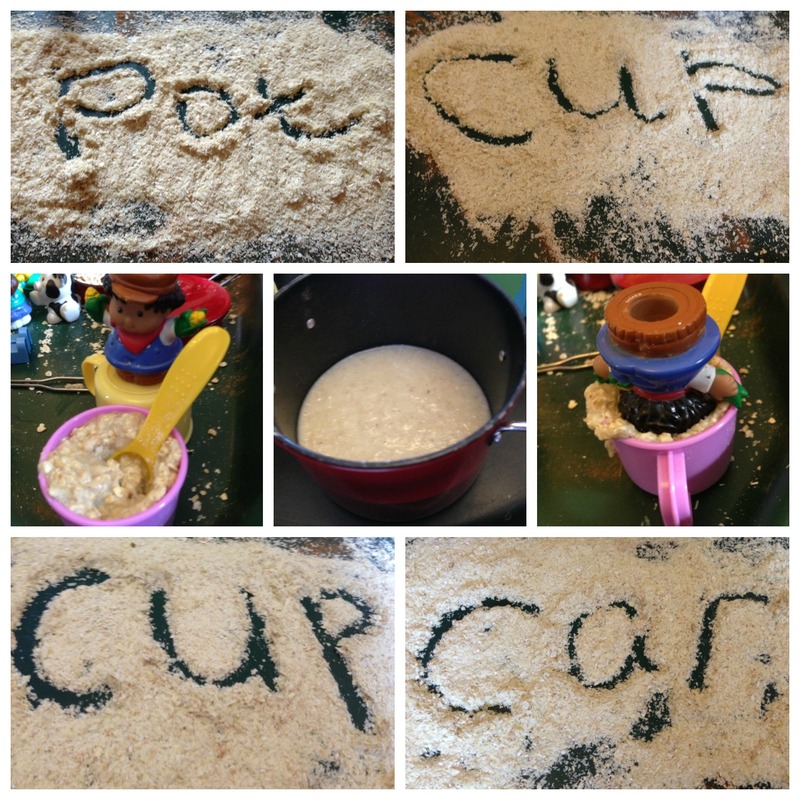 We are joining up again with the Messy Play for Matilda Mae linky, and also wondering if we are brave enough to start a linky of our own about activities based on books and stories. So what do you think? If there was a children’s book- themed linky, would you join in? If you say yes, then I will have to do it! This entry was posted in Children's books, Messy play and tagged messy play, oats, porridge, stories on June 9, 2013 by Hannah.